J.W. Jones writes: As discussed in the first article, “The Hidden Potential of Learning How to Trade SPX and Gold Options” I pointed out that there are several fundamental principles that must be mastered before profits can be attained when trading options. Novice traders typically skip the discussion about “The Greeks” and skim over volatility only to watch their precious trading capital disappear. The five core Greek symbols which are critical in order to understand are as follows, in no particular order: Delta, Theta, Vega, Gamma, & Rho. Most veteran option traders have a sound understanding of Delta, Theta, Vega, & Gamma. Rho is not nearly as well known, but anyone who has ever studied econometrics, option pricing models, or has studied applied finance know all too well the importance of Rho. For inquiring minds, Rho measures sensitivity to current interest rates. THETA - Θ, measures the sensitivity of the value of the derivative to the passage of time: the "time decay." Time decay (Theta decay) is of critical importance when an option trader is attempting to quantify and/or mitigate risk. There are two parts factored into the price of an option contract: extrinsic value (a major component of extrinsic value is Theta; the other is implied volatility) and intrinsic value which would be the amount of money a trader would gain if they exercised an option right away. A great many authors who opine about options get caught up using terminology like intrinsic and extrinsic value which only serves to confuse most novice option traders even more. I refuse to use those words in my writing as I find them to be cumbersome and option trading can be made much more difficult than it needs to be. Theta and time decay are synonyms when discussing options. An easy way to remember their congruence is that the word time starts with a “T” as does Theta. If a trader owns calls or puts outside of any type of spread, they are totally exposed to time decay (Theta) and as an option contract gets closer to expiration, the time value of the contract diminishes. This accompanied with failure to account for implied volatility (to be discussed in the future) are the fundamental reasons why so many people lose money when trading options. Just as theta can be an option trader’s worst enemy, it can also be used as a profit engine. If an option trader sells an option contract to open the position, that option trader is using theta as a method to profit or as a way to reduce the cost of a spread. While this article will not spend a ton of time discussing various option spread techniques, in the future we will discuss them in detail. At this point, we are only attempting to understand that Theta represents the time decay priced into an option. It is also critical to understand that Theta (time decay) is not linear in the time course of the life of an option and accelerates rapidly the final two weeks before an option expires. The rapid time decay the final two weeks before expiration presents a multitude of ways to drive profitability, but it also can represent unparalleled risk. While this article is just an introduction to Theta, the next article later this week will continue the time decay discussion. Since we are discussing Theta, I thought it would make sense to discuss a trade I took last week which utilized Theta as the profit engine. Recently a variety of underlying indices, stocks, and ETF’s have options that expire weekly. Weekly expiration expedites Theta and gives option traders additional vehicles to produce profits. 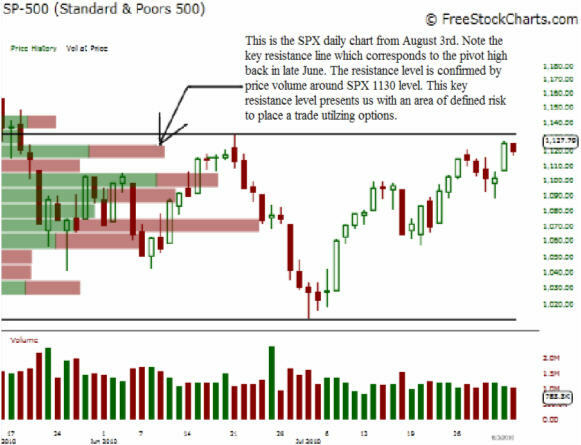 While most equity or futures traders might shy away from a chart like this, an option trader has the unique ability to place a high probability trade. I believed that the market would stall around the SPX 1130 area so I looked for a trade which would utilize the SPX weekly options. The SPX weeklies expire based on the Friday SPX open. With the SPX trading around 1124, I put on a call credit spread which used time decay as the primary profit engine. The setup I used involved selling an 1150 SPX call and buying an 1175 SPX call, which is also known as a vertical credit spread. I received $100 (1.00) for the 1150 SPX call and purchased the 1175 call for $20 (0.20). The $80 dollar profit represents the maximum gain per contract sold. As an example, if I placed this trade utilizing five contracts per side I would have a maximum gain of $400 dollars. The probability of success at the time when I placed this trade was around 78% based on a log normal distribution of the price of the underlying. Immediately after placing the trade I utilized a contingent stop order that would close my trade entirely if the SPX reached the 1135.17 area. Essentially, my maximum loss not including commissions was limited to around $60 dollars per contract with a maximum gain of around $80 per contract assuming we did not get a big gap open. Essentially, if the SPX stayed below 1135.17 for two days and opened on Friday below the 1150 level my trade would reach maximum profitability. This is a trade I actually placed on Tuesday afternoon, however I exited the position before the close on Thursday due to the impending jobs report which was set to come out Friday morning. I was able to collect over 60% of the premium sold per contract ($80) which came to about $45-50 per side. At $1,000 dollars risked based on my stop level, the trade would have produced a net gain of around $750 dollars in less than 3 days.